Michael walked along the neatly hung row of corpses, yawning as static buzzed through his headphones. The bodies weren’t human. They barely even looked it. In the dim light, though, during the after-hours in which Michael worked, the drooping heads and darkened eyes had a nasty habit of taking on the likeness of men. But then a stray gust from the air vents would disturb them, setting the corpses to swing carelessly, bonking against one another with tiny metallic clinks and refracting the half-light off their metal flesh. Robots. Not bodies. Robots. Michael repeated the reminder to himself intermittently, attempting a relieved sigh as his brain, if not his heart, held firm to the fact that he was not working in a graveyard or a slaughterhouse, but a simple store-room. Inventory was not a glorious job, but it paid, and that was enough for Michael. He yawned again. He was near the end of the B’s now, and the storehouse only held up to the mid-C’s. He would be going home soon. Save for faint ululations of static, B-712 was not making any noise. Michael tapped the bot absently. It shouldn’t be broken. The static responded with a slight but promising shift, and Michael poised his pen to check off another box. But instead of the regulated, mechanical words, there spoke a voice–a voice as clear as a church-bell, and at least as urgent. You should leave. It’s not safe here. Michael leapt back, tearing off his headphones to stare at the robot. Still motionless–but he hadn’t imagined that. He couldn’t have. The silence of the store-room was not as silent as it had been only a moment ago. Creaking and clicking sounded somewhere in the far reaches of the room, followed by a nearby crash as of a pile of cooking utensils falling. Heart pounding, Michael spun toward the sound, seeing nothing in the dim light but the uniform row of metal bodies. Then one of the hanging, dead-eyed heads flickered to life, and, turning slowly, fixed him with a cold, mechanical stare. Suddenly, ‘get out now’ seemed like excellent advice. The clanking and clanging had developed into a cacophony. Michael dropped clipboard and headphones alike, turning to flee out the door–but two hulking, steel-wrapped figures already stood in front of it. The storehouse had no other door. No windows. A design choice that, quite suddenly, seemed monstrously foolish. An arm circled around Michael’s shoulders, lifting him easily off the ground. “I told you it wasn’t safe here,” the church-bell voice said in his ear. And with a fierce roar, the thing hefted Michael across its back and charged the door. “I’m not going to hurt you,” the robot said, for perhaps the hundredth time. For perhaps the hundredth time, Michael refused to believe it. The thing had bowled over the bots blocking the door without a second thought. Torn through the door itself like it was paper–the door, a hunk of steel half a foot thick, built to withstand an army or a mob. Then it had started running, with no apparent purpose or instinct but to escape the bots pursuing them. Somewhere in the midst of all the bowling and tearing and fleeing, the horrible idea had come into Michael’s head that this bot was not the savior it seemed, but the danger from which all the others had, perhaps, awoken to protect him. This thought provoked a fresh fit of struggling. The bot, it’s unreasoning run finally halted, let Michael squirm off its back and collapse in a bruised and undignified heap at its feet. Michael scrambled to balance on his unsteady legs, a fuzzy plan of escape in his mind. In the uncertain light, Michael saw they were in a small dell of sorts–a flat space between the hulking monument of a disused highway and the brick skeletons of former apartment buildings. A half-dead tree and a whole-dead gas station sat dwarfed between the two giants. A sign with broken lights and garish, flaked-off paint rose like a protest from the midst of the weedy concrete. It read, ‘SUN-CO’. There was nowhere to run, even if he could outpace the bot–which, judging from the amount of time the bot had taken to sprint from the city center to its outskirts, he could not. Michael looked from the rather dreary scene to the robot, whose metal face had taken on an air of expectancy. “You are Michael,” it said, the speaker it had in place of a mouth giving a mechanical tone to an unmechanical voice. The name sounded strange, floating in the dead air like that. It sounded happy, and almost innocent; Michael, on the other hand, was shaking. He couldn’t be sure if he was scared, or angry, or simply shaken from the long and jarring run; whatever emotion was the spark of his inner tumult, anger quickly took the lead. “What’s going on?” Michael shouted, tensing his trembling fingers into unsteady fists. The robot jumped, looking up from studying his own, annoyingly steady hands. “Why did you kidnap me? Why are you all–” he was about to shout alive, but halted. They weren’t alive, that was the problem; robots couldn’t be alive. 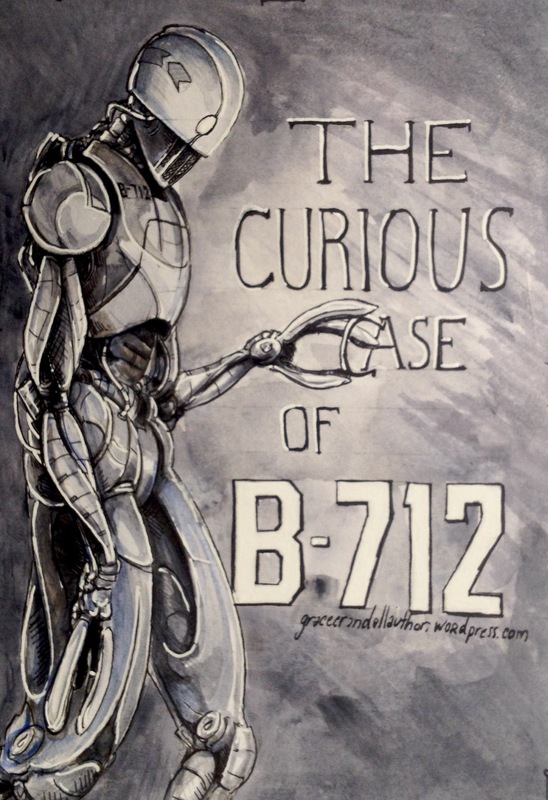 I have a name, B-712 had been thinking, looking with wonder at his own shining metal hands. There was something good about having a name. He wasn’t sure why associating a string of sounds with oneself made any difference in the grand scheme of things; but it did, nonetheless. This line of thought had been interrupted by the boy, speaking in tones somewhat louder than B-712 thought necessary. He was afraid, the robot realized with a flash of sympathy; afraid and confused. B-712 knew the emotions well, and spoke as softly as he could. B-712 raised his shoulders in an absent shrug. He seemed to think that explanation satisfactory, turning his attention to the open street as though seeing it for the first time. “We should go in there,” B-712 said, pointing to the empty convenience store. “Why would I?” The bot turned its glow-eyed gaze on him, cocking its head to one side. Michael had no answer, and B-712 nodded toward the store again. “We should go there,” he repeated; Michael opened his mouth to ask ‘why?’ Yet again, but the bot cut him off. In the short silence that followed, Michael heard the sound of distant footsteps–footsteps ringed with an edge of steel. Michael did not want to face off with a platoon of killer robots. The convenience store was an unconvincing shelter–he would have preferred something a little more solid, such as a tank or an artillery lockdown–but it was the only hiding place that immediately revealed itself. Michael sprinted for it, B-712 falling into an easy lope behind him. Once inside, Michael wasted no time in hauling one of the giant empty shelves to block the door. Or at least, he wasted no time in making the attempt. The shelf was heavier than it looked, and he was halfway to giving up the Herculean undertaking when B-712 (who had been watching him quizzically) picked it up as though it weighed nothing and set it before the doors. “Good idea!”the robot chimed, eyes glowing. Michael gazed at the door-block, realizing that if only one robot could put it in place, a whole horde of them would have no trouble at all knocking it down. He did not crumple to the floor, exactly; it was a bit more dignified than that. He sat, heavily, aware of the boy’s luminescent gaze but unable to meet it. There was a kind of suffocating silence within the store’s walls. The clanging distant footsteps were blocked out, and in the relative quiet, it was easy to forget about them entirely. Michael did not doubt they were coming, though, and pressed his knees to his chest in a useless attempt to stave off panic. Michael looked up to find the robot staring out the grime-coated window. Windows, Michael thought. Even easier to break than the door. There were supposed to be jobs in the country–better jobs, and clean air, and stars in the sky at night. The city was home, though, and some harebrained idea of loyalty had kept him here. Stupid, really; but he’d never claimed to be a genius. A flicker of light from one of the freezer-cases shone for a second on the linoleum floor, and Michael looked up, thinking that the glass had caught a reflection from B-712’s eyes–but no, B-712 was looking out the window again, and the thing in the freezer-case was no robot. It drifted like smoke–waxy smoke, Michael thought, though that made little sense. Wafting through the glass, the strange, light-ridden thing began to gain a shape. Thin, reedy fingers–a woman’s face. It was a hard-edged, sorrowful face, and Michael couldn’t take his eyes off it–but she didn’t seem to notice him. Casting a dim, greyish light all around her, she drifted towards B-712, reaching with a wispy hand to touch his shoulder. She seemed to be trying to speak. Michael was trying to speak as well, though the un-words he uttered were unintelligible as anything but an expression of surprised disbelief. B-712 turned, and the woman’s face went blank with fright as he saw her, tearing back the outstretched hand. Michael barely had time to register the look of pure terror on her face before, in a swirling flurry of smoke, she disappeared. Michael and B-712 turned to exchange confused glances, but before either could speak, the shelf that had been set to block the door went flying across the room, propelled by an inhumanly strong hand. Tall and grinning with their lipless mouths, they stomped into the room one after the other,pushing aside whatever stood in their way. There was no difference between any of them. That was the worst thing; they were a horde of homogeneous silver limbs and bodies, whirring and clanking and whispering as they moved, with nothing to tell one from the other save for the numbers that had been seared like a brand across their chest plates. The foremost of the uniform group was A-206. “I never said you weren’t a fool, but I didn’t expect you to act the idiot like this,” he said, in a voice as different from B-712’s as their bodies were alike–unhinged where B-712’s was precise, lurid where his was innocent. It was the voice of an unpleasant old man set in contrast with the voice of a child. The Others were forming a predatory half-circle around them, and B-712 had dipped into a faintly defensive crouch. B-712 cocked his head, curious at this new line of attack. Michael could feel the hatred leaching off of them–hatred so unwavering as to be almost palpable. Shakily, he edged closer to his single ally. “Bad!” A-206 exclaimed, in much the same tone he’d used for ‘think!’. He seemed to realize the repetition, and waved a steel limb in a gesture of dismissal. Michael did not at first understand. He only caught glimpses of the horrible ideas behind the bot’s words–life and death, graves and wombs. It was not the vocabulary of a newly formed artificial intelligence, and Michael realized, with no clear idea of what it might be, that this was something older. Something worse. Something was shining in the corner of his eye, and Michael glanced to see a silver-grey wisp forming into a woman’s face, a woman’s hand. She was back, reaching once more for B-712. Her arm passed, careless and cold, through Michael’s shoulder. Oh, he thought half-mindlessly. It’s a ghost. And then, with a thrill of realization : a ghost. Something human. Something not alive. Something that would talk, perhaps, just as A-206 was talking now. It sounded ridiculous, out in the open air–but no more ridiculous than ‘murderous philosophizing robot’ which, as far as Michael could see, was the only other option. “Well, look who showed up late to the party with a half-eaten can of sardines,” A-206 congratulated, spreading his arms in mock joy. “Why do you want to kill me?” Michael felt confident in the question. Which made little sense since he was surrounded by murderous ghost-bots. But then again, it was only a feeling–and feelings never make sense. A-206 grew oddly quiet, orb-eyes flickering. “Because you’re alive,” he said, with a shifting emphasis on the last word that turned it into a curse. He was evidently done with talking, then, for with an impossibly swift movement he reached out a dull, three-fingered hand to seize Michael by the throat.what work those engine-fed, steel-crushing muscles might have done then was left to a guess, for B-712 grabbed Michael and gently sent him careening out of harm’s way and into a wall. He faced A-206 with a mechanized rumble, planting himself between Michael and the rest of the world. A-206 replied with a growl, viciously swiping at the mesh of electrical lines in B-712’s stomach. Steam hissed and electricity crackled from the torn wires, and with a clash of iron and steel, the fight began. A-206 tried to wrestle his opponent to the ground–or rip him apart; it was hard to tell. The Others watched, motionless, obeying some human instinct that allowed for single combat; Michael, for his part, was slumped in a bruised and helpless heap on the floor. Together they fell, crushing one of the empty shelves. B-712 was thrown off, shattering an ice-cream freezer when he landed. Damaged wires sent sparks shivering along his body as he got to his feet, a light of battle in his eyes, and he rushed at A-206 again, punching into him with enough force to flatten both their plating. There was a firecracker flash of silver, lighting up the dark and showing, for a split second, two bodies that were not bodies locked in a hopeless struggle. Then the heaps of metal collapsed, reverberating through the linoleum floor, replaced by two drifting forms of wispy grey and silver–one bright and shimmering, which Michael knew without a doubt to be B-712, holding the other by the throat. They were both ghosts, or spirits, or souls–things like the drifting woman, and yet very different. The one Michael knew as A-206 had a face–a very definite form, carved out of the indefinite mist–and yet it was a dull, ragged-looking form, worn by time and tiredness. B-712 was as undefined as a flame–he had a sort of head, and something like hands, though neither seemed likely to keep and hold their form for long. In short, he was a thing of shining silver, too young to have gained much of a shape; and perhaps it was this that made him so much stronger, for he was holding A-206 in a strangling grip with apparent ease. “Not bad,” he managed to choke out before drifting away. “Not bad…” And then he was gone. The shining thing that had been B-712 looked at the Others–a silent challenge–and with a clanking of metal and a keening of voices, they fled as well. Their metal hosts clanked and groaned, slumping over in a mindless, innocent imitation of sleep. B-712 turned on Michael–his face was more defined now, and Michael was able to read a guileless smile there. Michael turned to see the she-ghost halt halfway through drifting into a wall. She leaked back into the room, the expression on her weary face inimitable. “Who are you?” B-712 asked again. “No one,” the wavering woman replied, too quickly. “Just passing through.” She drifted thoughtlessly through a slumped metal corpse as though to illustrate the point. B-712 shimmered, the beginnings of his bright contorting in the agony of near-recognition. The woman drew back as if to leave, and B-712 lifted a hand that was helpless to stop her–and yet it did, anyway. She was trying her best not to look at him, while he stared at her with unwonted intensity. The words drifted into silence, and when he spoke again it was in a tone so quiet as to be barely audible. Michael raised his eyebrows at the revelation, looking between the she-ghost’s face and B-712’s. They both looked scared. “I’m sorry,” B-712 said, his voice cracked and uncertain. She still looked scared–shocked too. Ghosts couldn’t cry, Michael realized; and, looking at her face, he realized just how tragic that was. She opened her eyes again, seeing Michael for the first time. Sorrow? Thanks? Whatever did that expression mean? Michael was never to learn, for the two figures faded and were gone without a goodbye. The metal corpses held their places like statues set to guard a tomb, and a street-borne wind whistled through the shattered doors. Numb with shock and aching with bruises,Michael gotto his feet and looked critically around at the wild conglomeration of robotics. In the sudden peace, he found himself savoring an unexpected thought. How on earth was he going to explain this to his manager? Oh wow…that was totally unexpected. I hated to come to the end! I have one other observation…just for a correction. You wrote: “He did not crumple to the floor, exactly; it was a bit more dignified than that. He sat, heavily, aware of the boy’s luminescent gaze but unable to meet it.” Should that be, “…aware of the BOT’s luminescent gaze…”? Just thought I’d mention it 🙂 Fantastic story! Great story. The sci-fi elements are great. I love the action and emotion in this. Well done, Grace. Thank you so much! I’m glad you enjoyed it–and thanks for reading!